3-4 pale blue eggs, spotted and scrawled with brown and purple, placed in a bulky nest of sticks, grass, and mud in a tree. Parks, towns, parking lots at fast-food restaurants, ranches, coastal marshes, wetlands, flatlands with trees. Common. Usually near water. 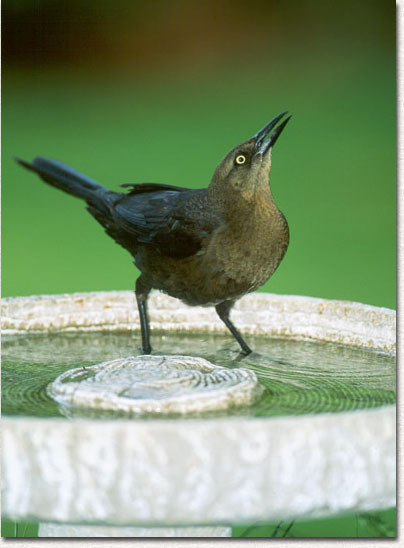 resident in California, Colorado in west southward to Louisiana, Gulf Coast. Insects, lizards, aquatic invertebrates and vertebrates, ectoparasites from domestic stock, bird eggs, nestlings; fruit, grain, grass seeds.
. mukudori 椋鳥 gray starling .